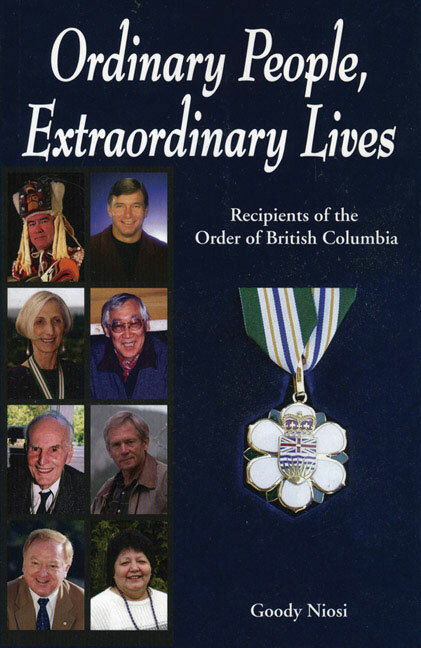 The Order of British Columbia was established in 1989 to recognize and honour ordinary citizens who have made a difference in the lives of others. Goody Niosi offers the stories of 17 of these recipients, from well-known people like Rick Hansen and Robert Bateman to lesser-known heroes, including Dr. Michael O'Shaughnessy, who has dedicated his life to AIDS research; Joan Acosta, who created the revolutionary newspaper The Westcoast Reader and helped adults acquire literacy and language skills; and Ric Careless, who has worked hard to ensure that precious wilderness areas are protected for future generations. Also showcased are Geraldine Braak, Dr. Leonel Perra, Dr. A. Hayward Rogers, Dr. Roger Tonkin, Grace Nielson, Hilda Gregory, Mel Cooper, Richard Hunt, Ross Purse, Takao Tanabe, Tim Frick and Merve Wilkinson. The foreword is written by former Supreme Court Justice Allan McEachern.